* Department of Periodontics, Rio de Janeiro State University, Rio de Janeiro, Brazil. ** Laboratory of Tissue Repair, Department of Histology and Embryology, Rio de Janeiro State University, Rio de Janeiro, Brazil. *** Laboratory of Cell Culture, Department of Histology and Embryology, Rio de Janeiro State University, Rio de Janeiro, Brazil. SUMMARY: The ultimate goal of periodontal therapy is to repair the damaged periodontal supporting tissues, permitting regeneration of the periodontal ligament. However, the cell response, the supportive matrix and the bioactive molecules use have not yet been well established. Bone marrow mononuclear cells were extracted from rat femurs and tibiae and cultured on a cross-linked collagen membrane, bone graft, or molar tooth to compare cell attachment and early proliferation on these materials. Cell attachment was quantified by light microscopy at 24, 48 and 72h, and cell proliferation was observed under a SEM after 72h. After 24h, the number of cells on bone graft was similar to that of the control and more than twice compared to collagen membrane (q=7.473 p<0.001) and 1.75 times greater than with tooth cementum (q=5.613 p<0.01). However, the number of cells close to bone graft decreased in the second day compared to the control. 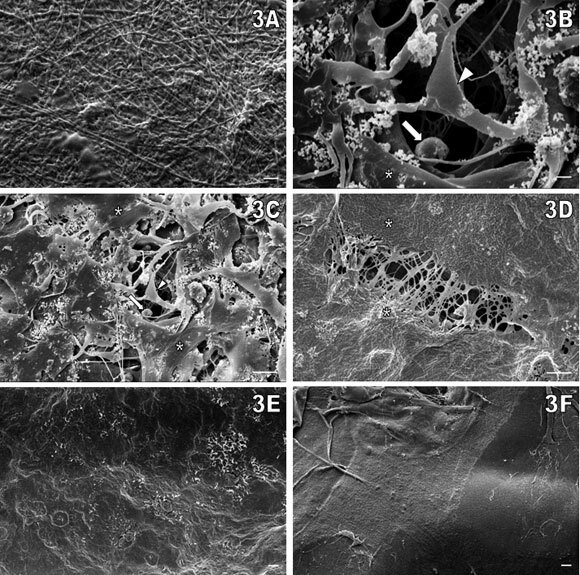 SEM examination revealed a significant decrease in the number of cells that attached and proliferated on tooth and bone graft when compared with membrane. The results showed that bone marrow mesenchymal cells offer great potential for colonize a collagen membrane. Key words: Stem cells; Collagen membrane; Bone graft; Cementum; Proliferation. RESUMEN: El objetivo último de la terapia periodontal es reparar el daño tejidos periodontales de soporte, permitiendo la regeneración del ligamento periodontal. Sin embargo, la respuesta de la célula, la matriz de apoyo y las moléculas bioactivas aún no han sido bien establecidas. Células mononucleares de la médula ósea se extrajeron del fémur y fibula de rata, y fueron cultivadas sobre un reticulado de membrana de colágeno, de injerto de hueso o de un diente molar para comparar la adhesión celular y la proliferación temprana sobre estos materiales. La adhesión celular fue cuantificada por microscopía de luz a las 24, 48 y 72h, y la proliferación celular fue observada bajo MEB después de 72h. Después de 24 horas, el número de células sobre el injerto de hueso fue similar a la del control y más del doble en comparación con la membrana de colágeno (q=7,473 p<0,001) y 1,75 veces mayor que con el cemento dental (q=5,613 p<0,01). Sin embargo, el número de células cerca del injerto óseo disminuyó el segundo día en comparación con el control. El examen al MEB reveló una disminución significativa en el número de células que se unen y proliferan sobre los dientes y el injerto óseo en comparación con la membrana. Los resultados mostraron que las células mesenquimales de la médula ósea tienen un gran potencial para colonizar la membrana de colágeno. PALABRAS CLAVE: Células madre; Membrana de colágeno; Injerto óseo; Cemento; Proliferación. Human periodontitis is an inflammatory disease affecting the gingiva, periodontal ligament, cementum, and alveolar bone, which affects ~10% of the adult population and can lead to bone resorption and ultimately tooth loss. Regeneration of the periodontal attachment requires recruitment of osteoblasts, cementoblasts, and periodontal fibroblasts to reconstruct these three distinct tissues (Donzelli et al., 2007; Zhao et al., 2008). Recent research has focused on regeneration of the periodontal ligament (PDL) using tissue engineering. A cell-based approach is one of the most promising alternative therapies for tissue engineering. Guided tissue regeneration (GTR) is now an essential therapeutic procedure, not only for the treatment of periodontal bone defects but also for bone and peri-implant defects, and for bone augmentation procedures prior to implant placement (Hammerle & Karring, 1998; Hammerle & Lang, 2001; Rothamel et al., 2004). Most of GTR techniques, bone graft is often associated with a collagen membrane for the treatment of infra-osseous periodontal lesions (Hasegawa et al., 2006). The bone marrow mononuclear fraction contains two subsets of stem cells of emerging importance for cell-based therapies: hematopoietic stem cells and mesenchymal stem cells. Bone marrow mesenchymal stem cells offer great potential for regenerating defects in bone, by direct addition of marrow to bone grafts, or by expanding in culture and adding them to the graft (Kadiyala et al., 1997; Chen et al., 2008). Studies demonstrated that different collagen membranes produce different regenerative response one another (Rothamel et al., 2004). This may be attributed to the influence of different components or structures (Gottlow, 1993; Takata et al., 2001; Rothamel et al.). Osteoblasts-like cells appeared to be incompatible with the collagen membranes, otherwise PDL fibroblasts adhered to most of collagen membranes (Rothamel et al.). The aim of the present study was to evaluate the biocompatibility of collagen membrane, bone graft, and cementum matrix in promoting the processes of adhesion, and early proliferation of bone marrow mononuclear cells. Cell isolation and culture. This study was approved by the Brazilian Committee for Animal Experimentation (CEA/147/2006) for the care and use of laboratory animals. Bone marrow mononuclear cells were extracted from femurs and tibiae of 2-month-old male Wistar rats under strict aseptic conditions. The bones were dissected in the sterile atmosphere of a laminar flow chamber. The epiphysis was removed and the medullar canal was washed with 10 ml of Dulbecco's modified Eagle's medium (DMEM) using a syringe. The medium containing the extracted cells was directed into a Falcon tube and the cells were suspended, homogenized, and centrifuged at 1500 RPM for 10 minutes. The pellet was suspended in 5 ml of DMEM, gently poured into 5 ml of Ficoll-Histopaque 1077 (Sigma-Aldrich, St Luis, MO, USA), and centrifuged at 2000 RPM for 30 minutes. The floating ring was collected, washed three times in DMEM, and centrifuged at 1500 RPM for 10 minutes. Cells were suspended in 1 ml of DMEM with 20% of fetal bovine serum with 1% penicillin/ streptomycin/ gentamicin and counted in a Neubauer chamber. Eight x106 cells/ ml were incubated in collagen-coated culture dishes and 24-well plates containing a thin porous microfibrillar bovine type I cross-linked collagen membrane, CollaTape® (Integra LifeSciences Corporation, Plainsboro, NJ, USA), Extra Graft XG-13® (Silvestre Labs Química e Farmacêutica LTDA, RJ, Brazil) bone graft, a rat molar tooth or alone (Control). Extra Graft XG-13® is a biomaterial composed of sintered (1100°C) and powdered hydroxyapatite (HA) and type I collagen (Coll), both of bovine origin, designed for osteoconductive and osteoinductive scaffolds (Rodrigues et al., 2003). Coll/HA proportions were 1/2.6 and 1/1 (wet weight), and particles sizes varied from 200 to 400 mm. Vv (volume density) and Sv (surface density) of the HA particles in the composite ranged from 0.48 +/- 0.06 to 0.55 +/- 0.02 and 5.090 +/- 0.545 to 6.366 +/- 0.289 mm-1, respectively. Extra Graft porosity is about 50% (Rodrigues et al.). Rat molar tooth were extracted and sterilized using an autoclave. After incubation for 24h, 48h and 72h, the specimens were gently washed with phosphate-buffered saline to remove cells not attached to the surface and fixed with 4% paraformaldehyde for 60 min. Cells grown on collagen membrane were stained with hematoxylin for observation under a light microscope. Specimens were also sputter-coated with gold for SEM observation (Scanning Microscope LEO1450VP, Zeiss, Germany). Microscopic analysis. During incubation for 24h, 48h and 72h, bone marrow mononuclear cells were analyzed under an inverted microscope. Five fields (objective: 10x) from each triplicate were chosen near the border of the membrane, bone graft, tooth and randomly in the control and photographed. The cells were counted in a 184 mm2 corresponding surface on the photographs and expressed as 104cell/mm2 ± SEM. All experiments were performed in triplicate and repeated twice and evaluation was done by two observers (DM and SC) independently. Cells counts were compared among the different biomaterial present in the culture using a Anova test followed by a Tukey-Kramer test to determine differences them with Instat 3.01 (GraphPad Software Inc., CA, USA). After 72h, coverslips from 24-well plates were stained by Romanowsky method (modified Wright´s stain) with the hematological staining kit Panotico Rapido (Laborclin, PR, Brazil). At SEM observation (Scanning Microscope LEO1450VP, Zeiss, Germany), five fields (x 400 enlargement) and 10 fields (x 1000 enlargement) were observed randomly at the materials. Collagen membrane was also scanned at the border and in the middle. Cell morphology was defined as rounded or spindle or flat (adhered) and the number of cells was also semiquantitative evaluated based in the observation of the number of cells found in 10 fields. Cell culture. Cells were observed daily, compared to their initial morphology and counted (Table I). After the first 24h, the number of cells cultivated with bone graft was similar to control and more than twice compared to collagen membrane (q=7.473 p<0.001) and 1.75 times greater than in cultures with tooth fragment with cementum (q=5.613 p<0.01). The number of cells close to the biomaterial decreased in the second day of culture compared to the control and we observed an increased in the cells close to the tooth cementum after 72h, but this was heterogeneous and not statistically different from the other conditions, including the control with less cells, however cells were also observed inside collagen membrane surface due to its translucence. Cell morphology. After 72h, the control group exhibited fibroblast-like mesenchymal cells with membrane extensions, lymphocytes, monocytes and many macrophages. SEM examination revealed a significant decrease in the number of bone marrow mononuclear cells that attached and proliferated on tooth and bone graft when compared with collagen membrane. Cells with different morphology grown on bone graft (Fig. 1) and tooth cementum (Fig. 2) when compared with collagen membrane. Most of the cells in bone graft and tooth cementum were round-shaped, whereas in collagen membrane they had spindle-shaped appearance like the mesenchymal lineage or round-shaped similar to hematopoietic cells; and even an endothelial coverage could be observed in border and also in the center of collagen membrane, with cells in close contact displaying membrane extensions (Fig. 3). cells (arrows) (1:3000) (C) and (1:1000) (D), and scarce spindle-shaped cells (arrowhead) (1:3000) (E). round-shaped cells (arrows) (1:3000) (C) and (1:1000) (D). Fig. 3. Scanning electron microscope view of rat bone marrow mononuclear cells adherent to collagen membrane in day-3 culture. 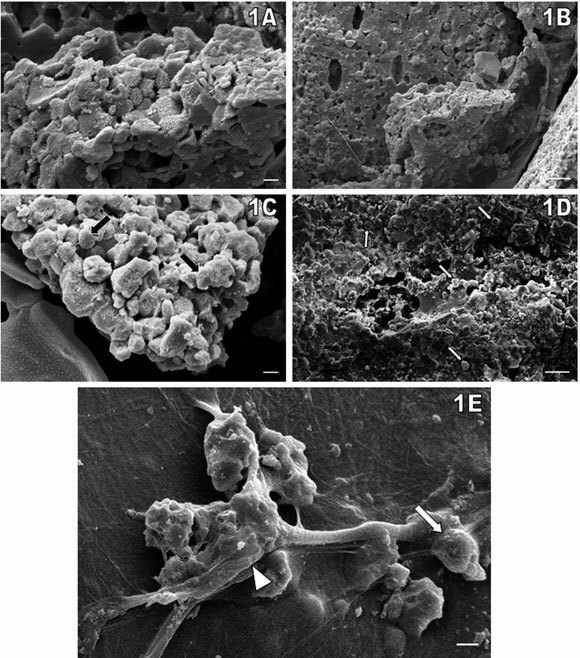 Collagen membrane surface control with no cells (1:3000) (A); spindle-shaped (mesenchymal) cells (arrowheads), round-shaped (hematopoietic) cells (arrows), and initial epithelial coverage (asterisks) (1:3000) (B) and (1:1000) (C); advanced degree of epithelization above lamina propria (asterisks) (1:1000) (D); full epithelization observed in collagen membrane borders (1:400) (E); to be compared with membrane surface control (1:400) (F). We compared the morphological aspect and the early proliferation of these cells in different biomaterials such as collagen membrane, bone graft, and cementum. Bone marrow mononuclear cells display great affinity for collagen membranes, which appear to be more advantageous over bone grafts for adherence and proliferation of these cells. Bone marrow mesenchymal and hematopoietic cells exhibit differentiated morphology after 72h in culture. In a recent review, bone marrow mesenchymal cells were considered better seeding cells than PDL cells in periodontal tissue engineering for their multilineage potential. Zhao et al. suggested that the regeneration of the periodontal tissues is dependent on four critical elements: cells, scaffold, appropriate signaling molecules and blood supply. Our study showed round shaped (hematopoietic) cells associated with collagen membrane tissue. However, the presence of these cells in culture to support angiogenesis is not well defined. Cells of the hematopoietic lineage are mobilized and then entrapped in peripheral tissues, where they function as accessory cells that may promote the sprouting of resident endothelial cells by releasing angiogenic signals, moreover these cells can also play major roles in tumor angiogenesis (Takakura, 2006). Therefore, manipulating these entrapment signals may offer therapeutic opportunities to stimulate or inhibit angiogenesis (Wang et al., 2002; Takakura; Au et al., 2007). The number of cells in culture dishes was significantly higher than on CollaTape® collagen membrane. These findings are consistent with previous studies that reported a greater amount of cells attached on culture dishes as compared with other bioabsorbable membranes (Takata et al. ; Wang et al. ; Rothamel et al.). However an increased number of cells were observed in association with Extra Graft XG-13® bone graft when compared with CollaTape® collagen membrane for the first 24 hours. The number of cells in association with Extra Graft XG-13® bone graft decreased in the second day of culture and the SEM observation showed round-shaped cells showing that bone graft appeared to be incompatible with cellular attachment and proliferation. The same rounded cell morphology was observed in another study for BioMend® bovine type I collagen membrane with fibroblasts and osteoblasts cultures (Rothamel et al.). BioMend® enhanced the early osteoblast attachment, since a similar amount of cells was also noted for polylactic and polyglycolic membranes. However, they noted that on BioMend®, the cells did not proliferate with time. They attributed to the influence of different components or structures noted in BioMend® like cross-linking with glutaraldehyde that could be a possible explanation for the decreased biocompatibility of this collagen membrane (Rothamel et al.). However, in another study with Extra Graft XG-13®, the authors deposited human osteoblast cells on bone graft surface. They observed that cells were sparse after 4 days of seeding with the concentration used (7x104 cells/ml). Polygonal cells were seen only after 11 days when the cell proliferation, adhesion and spreading were more intense (Rodrigues et al.). Proliferation of bone marrow stem cells may be have a lag phase or be detected in vitro studies with longer than 3 days. It seems that differences in HA exposure observed on different composite surfaces can affect the morphology of attached cells (Rizzi et al., 2001). In our study, althought Extra Graft XG-13® initially attracted a great number of cells it appeared to be not so effective for cellular attachment and proliferation, as with 3 days cells were found most in a round shape, as also in tooth cementum. Further studies are necessary to disclose if bone marrow cells would proliferate on Extra Graft XG-13® after 11 days of experiment. Membrane scaffolds with osteogenic supplements improve cell differentiation and mineral deposition (Donzelli et al., 2007). But when HA increased to 4%, the porosity and the pore size decreased because parts of the original pores in the scaffolds were occupied by the HA particles. This may be a rational reason for attempts of using 1% HA/chitosan scaffold in the regeneration of periodontal tissues (Zhang et al., 2007). This also could explain our results observed with Extra Graft XG-13®. The number of cells in association with tooth cementum was also significantly lower than on Extra Graft XG-13® bone graft. However these cells were round-shaped such as with bone graft. 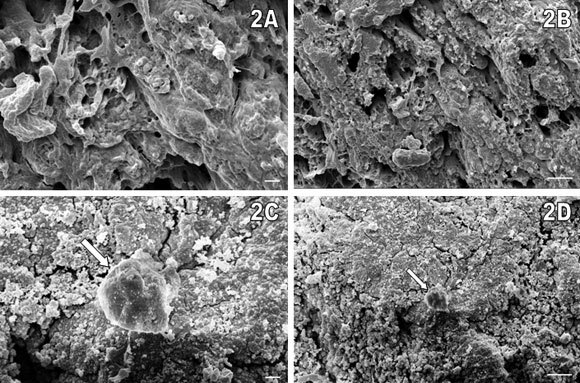 Another study showed that cementum granules sterilized into 2.5-megarad gamma irradiation cultured with fibronectin induce PDL cells for initial attachment, and cementum has provided evidence that these materials stimulate mineralized-tissue formation (Devecioglu et al., 2004) and better results could be achieved using enamel matrix proteins (Cochran et al., 2003) or growth factors (Nevins et al., 2003). Cell morphology can be regarded as an indicator of the affinity of the cells to a substratum (Trylovich et al., 1992; Takata et al. ; Rothamel et al.) related to the proliferation rate (Archer et al. ; Rothamel et al.) and migration (Burridge et al., 1987). Scaffolds seem to act as a physical support structure and insoluble regulator of cell activity and differentiation (Könönen et al., 1992; Harley et al., 2007). In our study, bone marrow cells in collagen membrane had spindle-shaped appearance like the mesenchymal lineage or round-shaped similar to hematopoietic cells. Our findings confirm that collagen and chondroitin-4-sulphate are the most suitable biomaterial to stimulate both cellular proliferation and extracellular macromolecule accumulation (Locci et al., 1997; Takata et al.). However, it may be assumed that many tested collagen membranes limit or even inhibit the attachment and proliferation of both fibroblasts and osteoblasts (Takata et al. ; Wang et al. ; Rothamel et al.). The presence of connective tissue cells on the inner surface of the retrieved membrane is one of the factors that may promote periodontal tissue regeneration (Machtei et al., 1994). In spite of Extra Graft XG-13® and tooth cementum, a great number of cells from different morphology were observed in collagen membrane. The bone marrow stem cells adherent on CollaTape® collagen membrane were flattened and differentiated, whereas bone marrow stem cells adherent on Extra Graft XG-13® were more round in shape, seem to indicate that CollaTape® offer surface conditions more favorable to the attachment and proliferation of these cells than Extra Graft XG-13® or rat tooth cementum. Furthermore, rat tooth cementum seemed to be incompatible with bone marrow cell attachment and proliferation. This study showed that bone marrow mesenchymal cells offer great potential for colonize a collagen membrane. It was also shown the advantages of CollaTape® collagen membrane over the Extra Graft XG-13® for adherence and proliferation of mononuclear bone marrow cells, allowing the differentiation of these cells into flattened and adherent cells. ACKNOWLEDGEMENTS. To Prof. Helio Rodrigues Sampaio Filho from Faculty of Odontology and Alan Cesar Nunes de Moraes from Laboratory of Electron Microscopy Prof. Luiz Henrique Monteiro Leal both from State University of Rio de Janeiro.